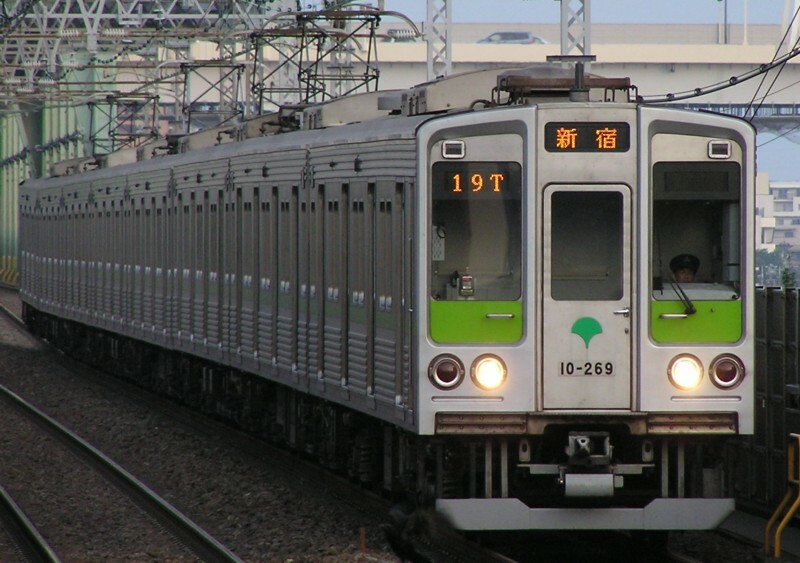 The 10-000 Series is a four-door commuter-type electric multiple unit developed by Bureau of Transportation Tokyo Metropolitan Government for the Toei Shinjuku Line. With plans for the construction of the Shinjuku Line underway during the early 1970s, the Bureau of Transportation decided it needed to develop a new train to be used on this line. One four-car long formation of this new train known as the 10-000 Series (Read simply as ten thousand) was built in 1971 and operated on the Mita Line until the Shinjuku Line was opened in 1978. While operating on the Mita Line, this single formation was given bogies to fit the 1067mm tracks. The production models that followed were generally similar to the prototype with armature chopper control, and regular steel frame surrounded by stainless steel outer panels. All trains built after the 19th formation (10-190F) are built entirely of stainless steel. The first seven batches of trains (10-020F~10-260F) are all generally similar in appearance, but the eighth batch (10-270F and 10-280F) has multiple cosmetic and technical differences. On the outside, the corrugated side panels were replaced with beaded ones and the end cars were given a new design. The chopper control systems were given more advanced GTO thyristor elements. At the time, chopper control was quickly becoming obsolete with the spread of variable frequency drive. 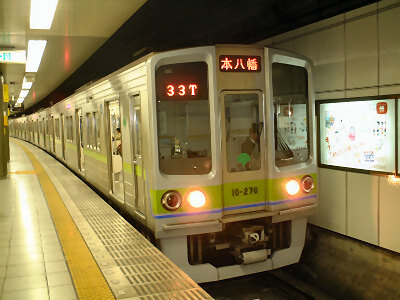 The 10-000 Series stuck with choppers because it was discovered that variable frequency drive would cause inductive interference with the Shinjuku Line's ATC system. The earlier semi-stainless 10-000 Series trains have been phased out of service with some cars being reused in 10-300R Series formations.